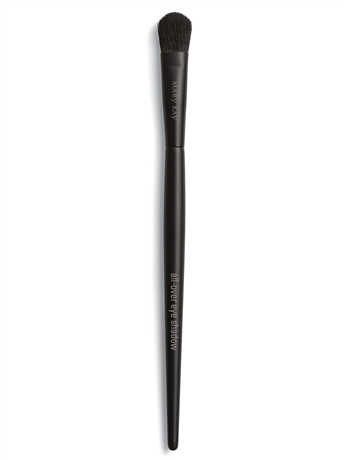 Apply eye shadow like a pro with this versatile brush. Its tapered shape helps it fit naturally into eyelid’s delicate contours, while it’s flexible bristles make quick work of blending to help diffuse edges. You’ll want to have more than one of this handy eye shadow brush. Features medium-sized tapered shape to fit in your eyelid’s natural contours. With new, feather-soft synthetic bristles, it can pick up the perfect amount of eye shadow and also beautifully glide on liquid and cream. Create multiple eye looks with ease! Use this brush to apply a small amount of Translucent Loose Powder under the eyes to set your look and help prevent smudges throughout the day. As a final step, lightly sweep the All-Over Eye Shadow Brush across the lid to help blend and diffuse shades seamlessly. This brush also is just right for applying highlighter to the tip of the nose, Cupid’s bow and tops of cheeks for a special added glow. Sweep a shade one or two shades lighter than your skin tone from the lashline to just above the crease to neutralise and brighten your lids.